There are many ways to adjust the zoom in Vivaldi. Drag the slider on the Status Bar to the right to zoom in and to the left to zoom out the active page. Click Reset to revert the zoom to the default value. You can switch the slider for buttons in Settings > Appearance > Window Appearance by ticking the box for Use Buttons in Range Controls. This will affect all range controls in the browser UI. Use the Ctrl + / ⌘ + Keyboard Shortcut to zoom in and Ctrl - / ⌘ - to zoom out of a page. The shortcuts can be edited in Settings > Keyboard > Shortcuts. Alternatively, focus on the zoom slider on the Status Bar and use arrow keys to change the zoom level. Pressing Home or End while the slider is focused will zoom the page to the minimum or maximum value (respectively). When Use Ctrl/⌘ + Scroll to Zoom Page is enabled in Settings (see image below), hold down the Ctrl / ⌘ key and use the mouse scroll to zoom. On a touchpad hold down the same key and with two fingers slide either up or down. Another option is to hover over the zoom slider on the Status Bar and use your mouse scroll or two finger slide on the touchpad to zoom. Change the default zoom level of every page you visit by using the range control in Settings > Webpages > Default Webpage Zoom. 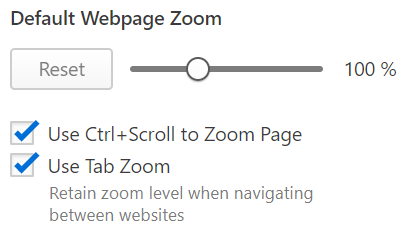 When Use Tab Zoom is enabled, the zoom level will stay the same on all the websites you visit in that tab. When disabled each site can have a different zoom level. Change the default zoom level by using the range control in Settings > Appearance > User Interface Zoom.